A happy fish is a healthy fish. And keeping fish healthy is our number one priority at Kenya marine center. Are you curious to know the reason behind our high quality fish at Kenya marine center and how we have achieved that? I will share with you our secret. Having Over a decade of experience in the fish industry we have gained informative skills and strategies that have played a great role in improving our fish health. The key thing we avoid in order to keep our fish happy is stress. A stressed fish is susceptible to diseases that jeopardize their health. At Kenya Marine center we go out of our way to ensure our fish are in a relaxed environment. We enjoy seeing our fish swimming freely and radiant in our holding facility before export. Acclimation is the process of accustoming the aquatic species to your aquarium water. 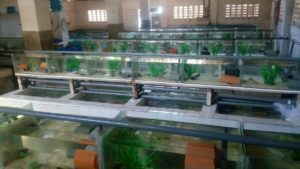 At Kenya Marine Center we acclimate fish brought in from the wild before introducing them to our system as we prepare them for export. This process is important because fish from the wild are adapted to ocean water which has a slight difference in parameters from the one in our holding facility. 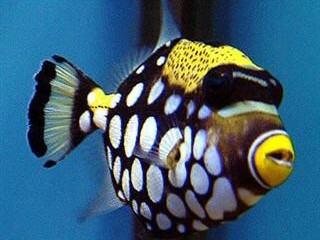 Introducing fish in your aquarium water abruptly might lead to stress or PH shock. That’s why we must acclimate our fish at Kenya Marine Center. In this method we float the fish bag for about 15 minutes in our aquarium water to equalize the water temperature. Then we pour the contents in a bucket and set up a drip line from the aquarium to the bucket. We ensure the water slowly flows into the bucket. Once the water level in the bucket is double that of actual fish bag water, we dispose half of the water without harming the fish and repeat the process. When the process is over, the fish is now ready for its new environment. Here are the major water parameters we observe, on a daily basis. Fish should be fed healthy, that you can read in every book. But what is healthy feeding? It’s ensuring your fish eat good quality food which is a must if you want them healthy. Good nutrition boosts fish immunity making them resistible to diseases. At Kenya Marine Center we are careful on selecting fish feeds as we understand that every fish has its own demands and needs, for instance, Doctor and tangs like vegetable based food while lions are predators. This strong opposition on feeding behavior force us to act on it. We are also very careful on the amount of food we provide for our fish. We ensure to provide just enough. Feeding too much can be risky. The leftover food decomposes in water altering the water parameters hence creating an uncomfortable environment for fish which causes stress. Underfeeding on the other hand will result to emaciated fish. Fishes who go in export are exempted from feeding for 24 – 48 HRS. Our Biological department watch the feeding 7 days a week as it is a daily task. A fish holding facility works different from a home aquarium and we as exporters have to react on it. In mass animal keeping, sanitation is a very important point. Out of this reason we have to do a regular treatment program for the whole facility. We have been practicing this over the past ten years which has played a big role in keeping our fish parasites free and healthy. Ensuring our fish are in a safe and suitable environment has increased their quality as well. Generally, we have been kin in observing all of the above and that’s how we have managed to have the best quality fish over the ten years. Our commitment to making our fish happy and healthy has resulted to us having the most admirable and happy fish. To sum it up keeping your fish happy is ensuring they are in a comfortable environment and knowing the right way to treat them. It is important to take care of your fish if you want them to stay healthy and of good quality. Aquariums are a wonderful hobby, providing hours of restful, beautiful entertainment. They can be a great way for children to learn about ecosystems, and they can help to relieve the stress of everyday life. They do require some work, thought, and planning, and this article will help you to get started. Your first consideration should be whether you can give your fish the care, time, and patience that they will need from you. Fish can be a large time and financial commitment, because they need special attention and equipment. And, since different fish have different needs, a trip to the library, book store, or one of many online resources makes a good starting point. For every kind of fish that you consider, you should address the following twelve areas of concern. 1. Start-up Cost and Fish Type Keeping aquarium fish typically has a fairly high start-up cost. This is mostly due to all the equipment needed to provide the fish with a proper environment. Purchasing an aquarium, filters, lights, and other essentials can add up quickly if you are not careful. Fish themselves can range from inexpensive to very expensive for special or rare species. For a beginning freshwater fish enthusiast, a typical aquarium start-up cost can range from $200 and up, depending on the types of fish and equipment selected. Marine (saltwater) fish and marine tank setups will cost more than freshwater setups. In both cases, the larger the tank the higher the cost will be. A typical tropical freshwater aquarium can safely support one inch of fish per gallon of water, although this will vary with the amount of water surface area. (More surface area allows more oxygen, which supports more fish. Fish length is calculated at full-grown size, less the tail measurement.) Some fish are schooling fish, which by nature are more comfortable in bigger groups. Other fish may not like to be in an aquarium with any others of their own species. And, if they are territorial – as most marine fish and some freshwater fish can be – they will need more room in the aquarium than the average one-inch per gallon. Both marine and freshwater setups have benefits and drawbacks. Marine fish are more colorful and beautiful, but require a higher level of care and expertise, so for a beginning fish enthusiast, a freshwater aquarium is recommended. Freshwater aquariums tend to be easier to maintain than marine aquariums because there are fewer water parameters to worry about. 2. Aquarium Size and Placement A good way to determine the size and type of aquarium you need to purchase is to get an idea of what kind of fish you find attractive. Your choice will be further restricted by where you can place the tank in your home, and by your budget. But as a general guideline, bigger is better. If you buy a larger aquarium than you think you need at first, it gives you room to add more fish later, if you choose to do so. The larger aquarium will also have more water, which can help dilute chemicals or other substances that may pollute the aquarium and cause illness in fish. No matter what size aquarium you choose, be sure that you can locate it somewhere with a level, sturdy, support surface, and where it is not in danger of being bumped into or knocked over. You should also keep your aquarium away from heater vents, windows, or doors, as these can produce harmful temperature fluctuations. Proximity to windows is also not recommended for aquariums, because it can allow too much light into the tank. Excess light leads to algae buildup, and you will quickly find yourself fighting a losing battle. 3. Patience and the Nitrogen Cycle* You may think that because your water starts out fine as you begin your setup, that it will remain that way. Not true. As you add fish to your aquarium, their waste produces harmful chemicals. Fortunately, nature provides a solution in the form of bacteria that break down these toxic chemicals into relatively harmless chemicals. The process nature uses to eliminate toxins from the tank is called the nitrogen cycle. Fish excrete toxic ammonia as part of respiration, and decaying fish waste and uneaten food produces additional ammonia. As the nitrogen cycle begins, the ammonia is converted by special kinds of bacteria into nitrites (which are also harmful), and these are then converted into nitrates. Excess nitrates can be controlled through routine water changes. The bacteria required for this process build slowly on the surface of your filters and gravel or substrate, and the process can take up to six weeks, starting from the day that you first add fish to your aquarium. Developing enough bacteria to maintain the health of your aquarium requires both time and patience on the part of the beginning aquarium hobbyist. You will need time to “cycle” the tank. There are various recommendations on how to accomplish this. The number one rule is to go slowly. This means, at first, you may only add some plants. After about two weeks, add a few hardy fish which are tolerant of changing water conditions. You should start with fewer fish than your aquarium can hold, then add any additional fish over a period of weeks, allowing the ecosystem in the aquarium to readjust (recycle) in between. Each step needs to be gradual so the bacteria have enough time to multiply and break down the increasing amount of waste products. Until the nitrogen cycle is established, it can be a stressful time for new fish and for you. It is a good idea to have an ammonia test kit on hand to monitor the nitrogen cycle by testing the water regularly. Despite the temptation to make changes to your aquarium, it is important that you not intervene unless ammonia or nitrite levels become intolerably high for long periods of time (temporary highs in both ammonia and nitrite levels are a part of the process). You should also avoid adding too many fish while the nitrogen cycle is being established, because you will disrupt the bacterial growth. As the cycle naturally progresses, the fish already in the aquarium can gradually adjust to changing water conditions with slightly elevated ammonia or nitrites. New fish might find these levels deadly. Once the nitrogen cycle is completed, your aquarium will be able to detoxify constant levels of ammonia and other chemicals as long as you maintain the bacteria colony. Keeping those colonies healthy, or optimizing the amount of bacteria in the aquarium, can be a function of the type of filtration equipment that you choose to use. *This classic method to cycling aquariums represents a traditional approach. Modern innovations have significantly reduced the length of the cycling process. Please take A New Look at Cycling for a quicker modern approach to establishing a functioning biological filter in your new aquarium set-up. 4. Filtration Equipment Determining the right filtration equipment is one of the most confusing but important choices that you will need to make. Essentially, aquarium filters work in three different ways. Biological filtration takes advantage of the natural bacterial process involved in the nitrogen cycle. Biological filter media provide larger surfaces for beneficial bacteria to colonize, ensure that water passes through the colonies, and help to protect those bacteria from being disturbed. Mechanical filtration removes unsightly particles from the aquarium. This may include fish excrement, sludge, uneaten food, or dust. Tank water is passed through a mechanical filter media, and the particles are strained out. To prevent build-up, the filter media must be cleaned regularly. Chemical filtration can remove some dissolved wastes from the water which a mechanical filter is unable to take care of. When water passes through a chemical filter media, the filter media chemically bonds with the waste molecules and holds onto them, thereby removing them from the aquarium. Canister filters incorporate various types of media under pressure to accomplish the three types of filtration. When under pressure, water is forced through media that it would not normally pass, thus providing us with great mechanical filtration. Biological filtration is accomplished with various types of media, such as Ceramic rings, and sponges. Chemical media can be any number of carbon or resins, or a combination thereof. Canisters are slightly more difficult to maintain, but allow the greatest flexibility with different types of media, and the best mechanical filtration. Power filters provide the convenience of a filter that hangs off of the back of the tank, and media changes are generally simple and convenient. Most of these types of filters use a cartridge, making media replacement extremely convenient. Some will also employ a permanent type of biological filtration such as a sponge or bio-wheel. They are good all-around filters and great for smaller aquariums (55 gallons or less). Larger aquariums may warrant more than one, or upgrade to a different type of filtration. Wet/Dry filters use a biological media, such as Bio-balls, or Bio-Wheels, to provide a very efficient biological filter. The water is usually distributed through a drip plate or spray bar across the biological media. This allows for optimum biological efficiency, and gas exchange. A wet/dry filter will typically use a sponge or other type of media for mechanical filtration. Chemical filtration may be added by the user. 5. Ultraviolet (UV) Sterilizers UV sterilizers can be used in the control of free-floating algae, bacteria, viruses, fungus, and even some parasites. UV sterilizers incorporate a germicidal or UV lamp in which the ultraviolet rays affect certain organisms based on the amount of ultraviolet rays they are exposed to. The effectiveness is based directly on the flow rate of the water through the sterilizer, the wattage and diameter of the sterilizer itself, and the size of the aquarium. UV sterilizers are particularly beneficial in reef aquariums and marine fish-only aquariums. While some freshwater aquariums will use a UV sterilizer, they are not nearly as common and not considered essential equipment. If a larger UV sterilizer is used to control parasites as well as bacteria, be aware that they can generate a lot of heat and may increase the need of a chiller in large reef aquariums. 6. Aquarium Lighting Proper lighting is essential for tanks containing live plants, or marine animals that are dependent on light for food. Good lighting will also make the aquarium and the animals within look more attractive. Since the animals are no longer exposed to natural sunlight, providing the proper spectrum and intensity is vital for their overall good health. 7. Heaters and Thermometers No matter what kind of fish you choose, they will have fairly specific temperature requirements. The water temperature in an aquarium must remain constant; if the temperature fluctuates too much, your fish can become stressed, which can lead to illness. Most fish need a water temperature between 75 and 80ºF. If you have one species in your aquarium, you can set the temperature specifically to reflect their needs. If, however, you have multiple species, 76 or 77ºF is a safe temperature range. Marine aquariums may require more attention to keep a consistent temperature, as they tend to need more light, which can warm the water. 8. Test Kits and the Addition of Conditioners, Supplements, and AdditivesThe welfare of your new aquarium is dependent on its water quality. You will find that you need to purchase various chemicals and additives to help it achieve and maintain the proper balance for good water quality. Depending on the fish that you choose, you may need special pH adjusters and buffers, or salt and trace element additives. Water conditioners are a must for removing chlorine and harmful chemicals from tap water, and test kits are essential to ensure that your water quality begins and remains at viable levels. 9. Food and Supplements Diet is an important element to ensure healthy fish, and the ideal diet goes beyond the basic “flaked” foods available in most stores. Flaked foods are sufficient for your fish, but feeding your fish flakes every day can be comparable to you eating nothing but rice every day and can eventually become quite boring. There are different options when it comes to your fish’s diet, but the key thing to remember is that a varied diet is best. 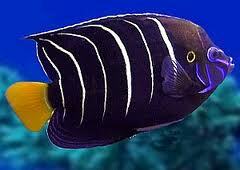 Plan on rotating fish food periodically and on providing supplements or vitamin boosters for added nutrition. This way the fish will be sure to receive all the nutrients they need and will remain active. Some fish enthusiasts prefer live food. You may hear a good deal of debate about this topic as you progress in your hobby. Live food has its own set of risks and benefits and is a big enough issue that it should be left alone by beginners. Freeze-dried foods and pellets make good alternatives, as do items like zooplankton and krill, which can be purchased. 10. Health Control Illness – it happens to all living things. At one time or another, your fish may become sick. While at first you may feel helpless, do not worry; there are a number of ways you can treat your sick fish in your own home. While most of the treatments depend on the specific ailment, it is a good idea to plan ahead and get another tank set up to use as a “quarantine tank” This is also useful before adding new fish to an existing aquarium. By separating the sick fish, you can speed up the healing process and at the same time, reduce the risk of spreading the illness to other fish. Fish ailments can be caused by a variety of sources. The most common causes of sickness are fungal, bacterial, or parasitic in nature. You will need treatments for each of the main types, and it is best to keep these on hand before disaster strikes. Be certain to get the fish home quickly, and ask the clerk to add extra water to the bag if you are going to drive more than fifteen minutes or so. Float the bag of fish in your aquarium to give it time to adjust to the water temperature. And, if you have made adjustments to pH or other chemical levels, gradually add water from your aquarium to the bag of fish over the next hour to give the fish time to acclimate. During this process, be careful to never add water from the fish store to the water in your aquarium. Remember, as a general rule of thumb, a tropical freshwater aquarium can safely support one inch of fish per gallon of water, though this increases with larger aquariums. 12. Do Not Forget the Live Plants While live plants may be intimidating to some new freshwater aquarists, they do not have to be. If you acquire some of the hardier species, they can thrive in most aquariums and are notably beneficial in controlling algae, improving water quality, reducing stress for the fish, and making your aquarium look more natural and beautiful. If you will have plants, provide at least 1.5 watts of lamp power for every gallon of water in the aquarium (2-3 watts is better). Choose a medium to fine gravel substrate, and ideally, add a slow release fertilizer. By following these few simple rules, you should have your aquarium up and running smoothly in 6-8 weeks. Remember that a larger tank is easier to regulate and allows a greater variety of species. While a 10-gallon tank may initially appear a little cheaper, a 29-gallon tank is a better starter tank and is going to provide a better environment for your fish, and a more diverse population of fish. 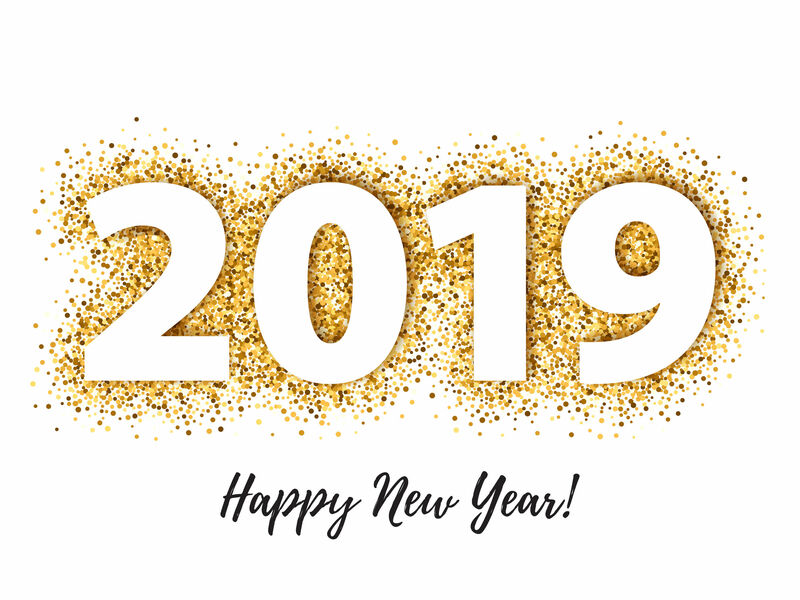 From all of us here at Kenya Marine Center, Happy 2019! Any new year resolutions for your tanks, fish or feeding methods? Our wish this year is to have even more opportunities to serve you better, expand to more regions, engage more people with our livestock and participate more in projects that help inspire appreciation for our marine life and their conservation.